"Here's a salad with loads of disease-fighting antioxidants in the potatoes, tomatoes, onions, basil, garlic and olive oil. True, white potatoes tend to boost blood sugar, but the vinegar in this recipe helps to suppress such rises, making this a healthful salad." 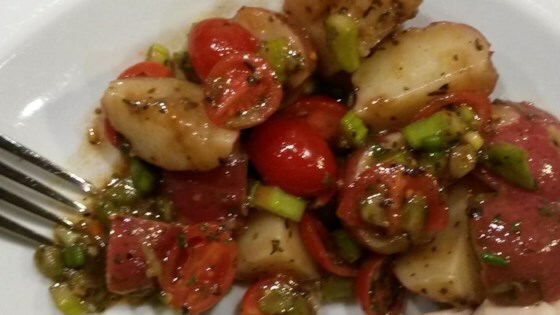 In a large bowl, combine potatoes, tomatoes, onions, basil, and celery. In a small bowl, whisk together garlic, vinegar, oil, mustard, salt and pepper. Add dressing to potatoes and toss. Refrigerate until ready to serve. Didn't care for this at all. Tried it both warm and cold. Won't try again. I tried this for my husband yesterday and we both loved it. Couldn't stay away from it. He grows fresh basil, so that is what I used. Excellent! I will be making this again often! Wouldn't change a thing; we absolutely loved this potato salad. For anybody doing Weight Watchers Plus, this calculates to 4 points (WOW!). This is going into my Favorites folder. Very tasty. Great for a picnic!